Kick offs: 14:30 BST and 16:45 BST Coverage: Blues v Ospreys live on Scrum V Live on BBC Two Wales, BBC Radio Wales, BBC Radio Cymru, online, mobile, the BBC Sport app and Connected TV. Dragons v Scarlets live on S4C, BBC Radio Wales, BBC Radio Cymru, online, mobile, the BBC Sport app and Connected TV. Live text commentary on both matches on BBC Sport website. Wales captain Sam Warburton has had "a few stern words" with his Cardiff Blues team-mates, says caretaker coach Dale McIntosh. 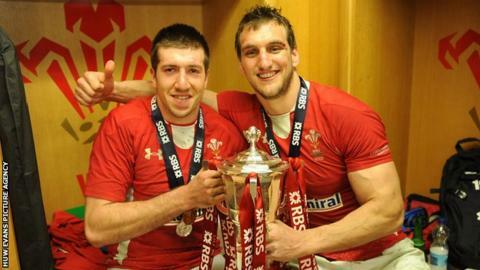 Warburton will face Wales open-side rival Justin Tipuric when Blues take on Ospreys at Millennium Stadium. McIntosh says the outburst shows the "respect" Warburton has for Tipuric in the build-up to Saturday's match. "Sam actually piped up in training because we didn't start as well as we'd like to," said McIntosh. "He had a few stern words and that's not like Sam." "They play consistently well, the table doesn't lie," said McIntosh. "We've got a lot of respect for their playing staff and their management. "We understand to get anywhere near them, to compete against them, we need to raise our game and get up to sixth gear and we haven't got anywhere near that this season." The match is part of Welsh rugby's Judgement Day event, which also sees Newport Gwent Dragons face Scarlets.